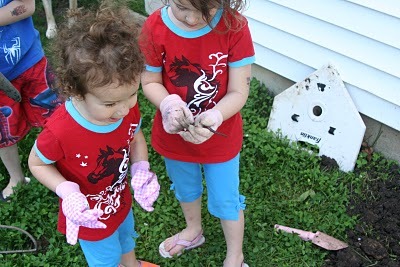 Yesterday after the splash park fiasco, I decided that we should finally plant our small little garden. One year I did tomatoes and zucchini. The next year, tomatoes and lettuce. Zucchini takes over the entire garden and lettuce just always stayed full of dirt (not too fun to eat). Last year, just tomatoes, but way too many. We couldn't eat all the tomatoes that we grew. 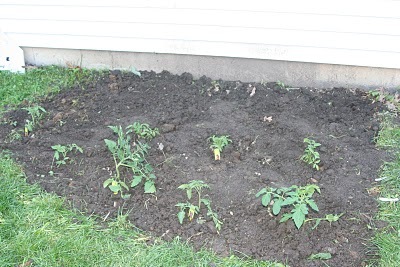 This year we are going to grow tomatoes (see a running theme here) and pumpkins. We all love love love tomatoes, so this is a must plant every year. I have the smallest little spot to plant, so I only can plant two veggies at a time. Last year I did not even clear out the old dead tomato plants and the garden was completely overgrown with grass and weeds. So I had my work cut out for me. 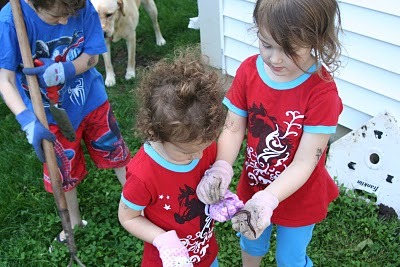 With a spade and rake, I got to work, pulling weeds, turning over the dirt, reshaping the garden bed. 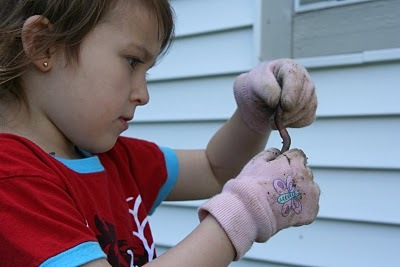 The children were in WORM HEAVEN. I'm not too worried about the soil quality with the worms that I kept turning up. To the delight of the girls! I uncovered this big, fat, juicy worm (frankly it was the largest worm I have ever seen), I must have cut him in half without know it though. 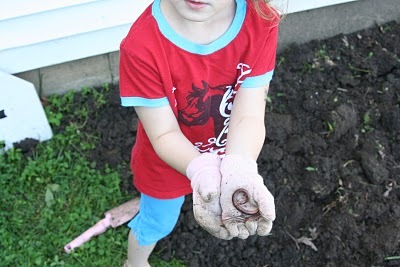 Daughter picked that fast little sucker up and we quickly discovered that he was quickly becoming two worms! (Eww & Gross) She decided to share with baby. See baby squealing in a picture below. She was so happy! 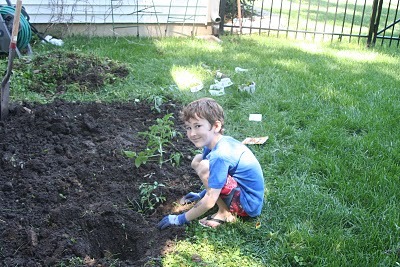 Son helped with the tomato plants, he was a great helper too! He passed out all the pumpkin seeds and shared well with his sisters. After two hours, we were finished. I hope nothing dies, especially my tomatoes. With the current outbreak of salmonella in tomatoes, I would like to avoid purchasing these veggies from the store for awhile. (this will be hard because my children eat tomatoes like candy). I also really hope the pumpkins grow and turn orange. This will be fabulous for the children around October and save our pocketbook! This garden is nothing like my blogger friend, Rigby Ericksons , The garden . I am actually embarrassed (and a bit jealous) to even call this little spot in my yard a garden after seeing her fabulous garden. You must take pictures throughout the season Miss Gini! A job well done and the kids were happy. Especially daughter! Which made it all worthwhile since she was so miserable in the morning! ***Oh, I woke this morning, didn't shower, didn't apply any deodorant, went to park, came home, still didn't shower, dug in the garden (and I was digging and turning dirt with a spade for over an hour), planted garden, played with children, made dinner (grilled, so even grimier), cleaned up, played outside with the children. AND. . . AND . . . I still don't smell!! It's a miracle! I'm loving Secret Clincial right now!!! Happy, Happy, Joy, Joy, . . . for about 4 minutes!